This past month has been a busy one for many of our Island Lakers as they celebrated their Bar and Bat Mitzvahs. Some families have shared pictures with us from their children’s milestone events so I’d like to post them here for everyone to enjoy. 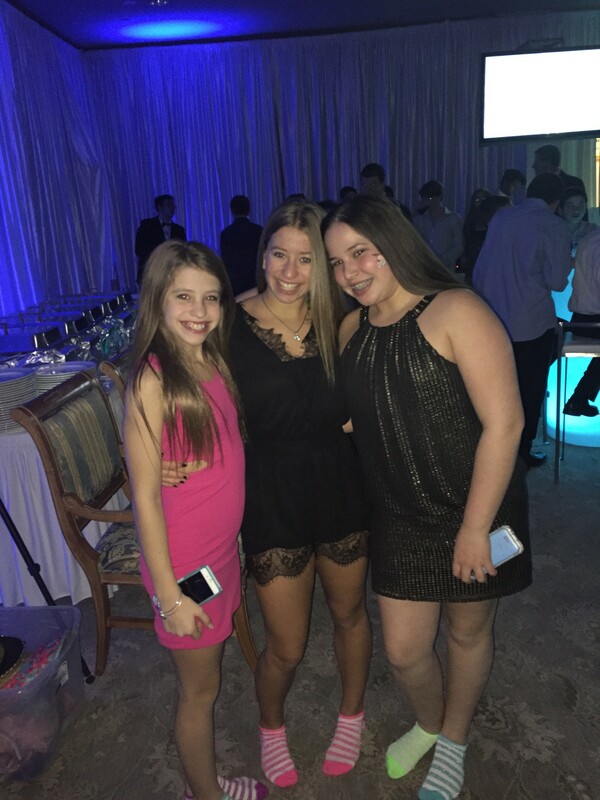 Mazel tov to Hallie Maytin who just celebrated her Bat Mitzvah this past weekend on Pi Day (March 14th). Wendy had the pleasure of heading to Maryland to celebrate with Hallie, her sister Olivia, her cousin Ethan (both of whom are Island Lakers), as well as several camp friends: Brooke V, Danielle H, Hannah M, Rachel P, & Tyler L. The “Camp Hallie” theme was absolutely fantastic and we all had a wonderful night of dancing, eating camp food (don’t worry, it wasn’t actually from ILC), lighting a candle to a favorite Color War song, “Away” (“The cold nights, the warm days,…”), and creating wonderful memories for Hallie. Thanks for a fantastic weekend! 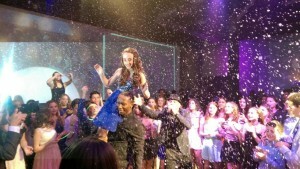 A very special Mazel tov to Maya Stone who just had her Bat Mitzvah on February 28th. Although the Stoltz family was unable to attend, we were all there in heart and spirit to cheer Maya on. We hear she did a fantastic job on the bimah and the celebration was out of this world (as we can see in the photo below). Maya celebrated her special day with her brothers Jackson & Trey, as well as many of her camp friends. Check out this beautiful family below. Mazel Tov, Maya! Dara Ort also celebrated her Bat Mitzvah on February 28th in Boca Raton, Florida. Although her camp friends couldn’t fly down for her special event, we hear they all wanted to be there for her and they’ll just have to celebrate at camp this summer. Her brother, Garrett, represented for all of us! Dara looked amazing on her special day and she appears to be on cloud 9, at her happiest (well that is, other than when she’s at Island Lake but of course). Mazel tov to you, Dara! Look who ran into one another recently at a special event that we can only assume is a Bar or Bat Mitzvah,…the Maskell family and the Checkoff family! What a small world. Sure goes to show you, you can take the child out of Island Lake, but you can never take Island Lake out of the child! We are everywhere! Below we have fantastic pictures of Griffin Maskell & AJ Checkoff and Riley & Dylan Maskell with Montana Checkoff. We hope you all had a wonderful time together and thanks for sharing these photos with us! Summer 2015 is approaching and we are busy planning for another incredible camp season. There is a great deal of information in the folder you recently received that is relevant to preparing your child for a successful camp experience. Please take some time to read through our literature thoroughly. We encourage you to use our online system instead of paper forms to submit your profile and transportation information. We cannot emphasize enough the importance of filling out the profile and medical forms in a detailed, timely manner. These forms are due back in our winter office by May 1. They provide us with important information about your child so that our staff can have thorough, accurate knowledge about each camper in order to provide him/her with a safe and successful summer. The medical form is not available to fill out online as original signatures are required. We also need your transportation information by May 1 in order to finalize our bus numbers. FORMS: All forms are due back in our winter office by May 1. PROFILE FORM– Please give attention to the profile form, as it provides valuable information for us in assuring your child a successful camp experience. TRANSPORTATION FORM– All campers must take the bus to and from camp. The bus ride begins and ends the camp experience. We must have your form in order to finalize the number of buses for each location. We will assign your camper a bus if the form is not received by May 1. (Please call us if you need to make special arrangements.) If your child is flying to camp, a letter with more details is enclosed in your folder. OPEN HOUSE: Since many new Island Lake families would like to see the camp prior to opening day, we are hosting an Open House on Saturday, June 13. All new campers and their families are invited to attend. This is a great way for first-time campers to feel comfortable with their decision and we strongly encourage you to join us. The day will begin at 11:00 am and will continue until approximately 3:00 pm. There will be tours as well as a buffet lunch. After lunch, we will have games and activities for the campers and a question and answer session for the parents. The day will start promptly at 11:00 am so please be on time. Also, please remember that pets are not permitted in camp. CLOTHING CATALOG: Enclosed is a pamphlet from an outside company featuring Island Lake clothing. Remember, Island Lake is not a uniform camp and you are not required to purchase any camp clothing. All campers will receive an Island Lake t-shirt upon their arrival at camp and all other clothing is optional. Feel free to call if you have any questions. We are always available to you. Happy March! As we sit here in our winter office with tons of snow outside our windows, it feels as though summer 2014 is a distant, yet fond, memory. However, our summer 2015 countdown has kicked into gear and lucky for us, summer, and for that matter camp, will approach before we know it. All summer 2015 families will receive your annual Island Lake folder any day now. This folder contains TONS of information to prepare you and your children for this summer. There are forms enclosed that we request you return to us promptly. The Profile Form helps us guide your children when they choose their activities and put together their schedules. The Medical Form must be completed by both, a parent and a physician, as required by Pennsylvania law. The Transportation Form lets us know which bus your children will be taking to camp. If we do not receive the Transportation Form in our office by May 1st, we will have to assign a bus to your children. In June, we will send you detailed information on the bus locations, along with luggage tags that you will use to mark your children’s bags. If you misplace any of your forms, they will be available for download here on our website. You can access them by clicking on ‘Forms & Mailings’ to you left-hand side of this page. There will also be information in the folder instructing you how to fill out the transportation and profile forms on-line. A reminder to our summer ‘14 and ’15 families, don’t forget to read our monthly newsletters. You can access them here on our website or at the start of every month in your mailbox in hard copy form. The newsletters provide important information for parents as well as campers, including enrollment and availability updates. Speaking of enrollment, if you haven’t yet registered your child for summer 2015 but plan to do so, please, please, please do not put it off any longer. We truly do not want to turn away any of our devoted campers and it’s very difficult for us when forced to do so every year. Please don’t let that happen to your child. Some bunks are already full! It only takes a few minutes to fill out the registration form, we promise! If you don’t have one handy, click “ILC Families”, “Forms & Mailings” and then print the “2015 Enrollment Form”. To all current Island Lake families, we look forward to an amazing summer 2015 with your children. To all prospective families, feel free to contact us if you have any questions after browsing our website: 800-869-6083 or 914-769-6060. And last but not least, to one and all…. ILC U THERE!